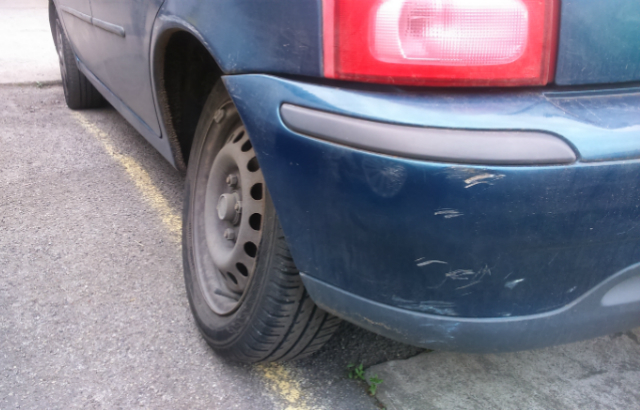 It’s been a while since we’ve put out a new edition of our MOT horror stories. 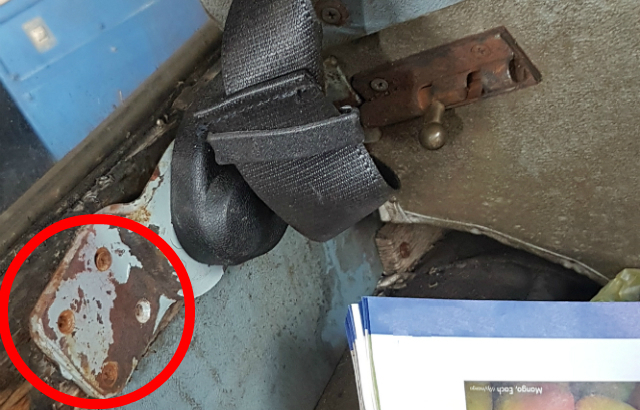 But, seeing as it’s Halloween, we thought we’d show you some of the more horrific and scary things MOT testers have found over the past few months. Some of them might make your hair stand on end! Our first scary story is of a brake caliper pin that could have had serious road safety implications. Callum sent this image to us after a customer brought their Fiat 500 in for its MOT test. The nominated tester failed the vehicle for low front brake pads. The customer told the tester they’d have new pads fitted elsewhere, and then bring the car back into for retesting. 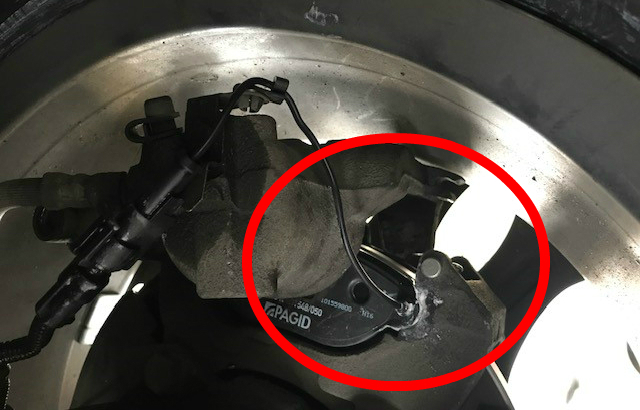 When the car was retested, the tester found the pin had quite obviously missed the caliper, causing it to be insecure. This might’ve been accidentally missed by a professional mechanic but it’s more likely the new pads were fitted by an amateur mechanic, possibly a friend of the customer. Either way, if the nominated tester hadn’t spotted this, it could’ve seriously reduced braking power, putting the driver and other road users in danger. Our second terrible tale concerns a seatbelt that could have detached from its mountings at any moment. Luke sent us this photo of a Morris Minor with a dangerously unsafe seatbelt that he had in for testing. The rear seatbelt had been screwed onto the wooden frame of the car, which was pretty worn and decayed. The problem was that there was only 1 screw holding the seatbelt in place! The 3 other screw sockets were empty. If the car was involved in a crash, there’s a good chance that the single screw holding the seatbelt in place would fail. To make matters worse, the seatbelt was securing a child seat. If the tester hadn’t spotted this, it could’ve given way in a crash, possibly resulting in the injury or death of a small child. Our final frightening yarn relates to a cracked axle and wobbly wheel that could have seriously endangered the driver and other road users alike. 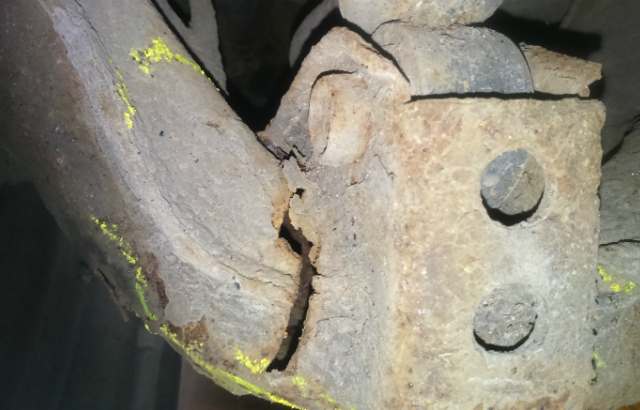 The photo above shows a badly corroded rear nearside axle on a 2001 Nissan Micra. After the tester had identified this damage to the axle, they carefully lowered the car down to the ground and then parked it in the garage forecourt. This is what the wheel looked like! Thankfully this happened at an MOT garage but the customer who brought this car in had been driving around in it in the days leading up to its MOT test! If the wheel had failed like this while driving, it could’ve put the driver and everyone else on the road in serious danger. Luckily, all of these vehicles were caught before they could do any damage. Things could have been much worse, and much scarier if it weren’t for the good work that MOT testers do up and down the country. Thank you to everyone who has sent horror stories to us. Please keep them coming. Transit tipper in a couple of months ago for a starter motor, our young mechanic changed the damaged starter .Had a quick look round underneath AHHHHHA !!!!!. We all just did not believe what he discovered , No o/s rear caliper, hose turned back & clamped off. Handbrake cable cable tied to anti roll bar, n/s rear pads grinding their way through the disc . and virtually no pads left on front of the truck, severe corrosion all over the place . photographs were taken, & customer warned about the dangerous state of his vehicle !!! both verbally and in writing .There was nothing to stop him from driving it away with his devil may care attitude. left us in a precarious situation of questionable responsibility. Providence provided the solution!! when he called us to a no start situation well of the beaten track a week later. Severe corrosion adjacent to a main earth point . rendering it impossible to fix !!. Some sort of prohibition order may be a better way of getting Joe Public to keep their vehicles up together. and have more respect for the local test facility. ?Why do we have to let tested vehicles that have been found defective and flagged as Dangerous back on to the road ,surely there insurance must become invalid as they are knowingly driving a vehicle in a dangerous condition .Perhaps Joe public needs to be made more aware of his responsibilities at an earlier age (responsibilities lessons at school may help, or maybe an app on their phones ) . Well done for showing a dangerous seat belt on a ‘vehicle of historic interest’. It really is quite amazing given that you intend to go ahead with exempting such vehicles from the MoT test even when the majority of respondents within your consultation disagreed with you! We've recently updated the guide to bring it more in line with the new testing service. We wanted to easily be able to update the guide and the quickest way for us to do that in the short term is edit it as a word document and then host it as a PDF online, i appreciate this is not ideal as it makes viewing specific sections of the guide difficult. Next year we plan to change how we host the guide online to allow for better navigation. It is totally crazy and very short sighted not to MOT all vehicles regardless of age . Especially with the Sue culture which we all have to be very aware of in all respects of the Motor Trade let alone the mine field of Mot's . We should all be charging the full fee and cut out all the gimmiks that abound across the country . It is about time that common sense prevailed and the thousands of genuine garages and Testers do not get tarnished with the brush as the rogue and and get rich quick minority who do not give a monkey's about their customers . We are a small family business that began in the nineteen thirties and still going strong as are many thousands of other garages who care about their customers and business. Very well put James I totally agree with all your comments. Totally agree with James , we should charge the recommended rate across the board. I totally agree,the mot fee should be a set rate.The amount of company’s that offer half price mots just to get the public through the door,then fail the vehicle on problems that done even exist.This make my blood boil,it tars all of the motor trade with the same brush! I work for a large chain but pride myself on doing an honest test and my repeat customer level proves this. Totally agree that the MOT test fee should be standardised and mandatory, maybe at a slightly reduced level (£47.50 maybe) to calm the transition for both customers and test sites alike. Could we please have YOUR comments and opinions on the imminent, age-related vehicle (MoT) exemptions? And if you could do this without mentioning the E.U. or DfT, or statistics then that may enhance your credibility. Please don’t make yourselves conspicuous by your absent response/s. Let me ask you, do you think that every (qualifying) vehicle that failed its last MoT and went on to have a SORN should be required to pass a ‘test before being allowed back on the road in its newly acquired ‘exempt’ status; a minimum road worthiness standard if you like? ‘Advisory defects’ will never have been so important will they not? We agree that making advisories is important. We're trying to improve the consistency and usefulness of them by making sure all the advisories are easy to find and the full range needed is there. As you will see from the separate blog on the subject we are considering, as part of this, whether we will need to have ‘manual’ (hand typed) advisories or not as well as the selectable ones. DVSA is an agency of DfT, acting on behalf of the Minister. We implement the rules ministers have agreed. Our opinions were presented as part of the decision making process. Pre 1977 vehicles Rusted more than post 1990 vehicles, They were a lot less reliable, they had inferior brakes, suspension and lights, Can someone explain to me Why pre 1977 vehicles should be exempt from an annual M O T test? And what good would it do? given the justification for the pre 60/rolling 40 year exemptions was that they get well looked after and do few miles then surely this means that the average builders shed of a transit or courier motor doing 50k a year obviously requires testing 4 or 5 times a year(at least! )or am I misunderstanding the statistics.before dvsa start to witter on about how they've released guidance to the owners on maintaining the above sheds I have to point out the effect that had.ZERO! Aparently you wernt around when all these broken down rust buckets litterd our roads!you are very wrong!just look how many old rustbuckets are still on the road.my 1936 standard just needed a patch in the boot!our 1958 ford consul sills and a bit in the boot yet merks transits ect are still rotting with all the technolodgy we have today! My vehicles get checked regularly now ime responsible for there condition,not just the week before the MOT. I was around when they littered our roads,i remember seeing marinas/itals/triumphs/alpines et al lying by the side of the road with snapped trunnions/popped balljoints etc on an almost daily basis.my point was that some owners will do a good job and have a decent motor,others will do nowt till it falls off hence the comparison to the modern builders transits etc.if the justification is that they don't do many miles then surely vehicles that do lots must need testing more frequently?regarding the roadworthiness of a vehicle it has ALWAYS been the case that you could be prosecuted for driving a vehicle with defects,this goes for 356(or 366! )days a year not just on the day of your mot.the mot is a minimum standard that all cars are expected to able to meet at all times,your 1936 standard would have benn tested to much lower limits on many items compared with a modern car simply because that was the level it was expected to meet when built,most corrosion as an example has to fall into set areas which in many instances would not apply to your vehicle.to give you an example I test a Hillman hunter every year.not to put too fine a point on it it belongs in a scrapyard,its structure consists of dozens of patches welded over one another for decades,he has a detachable plastic tray under the engine as it leaks so much oil he needs to be able to pour it back in after every journey and every part and system of this vehicle is in similar condition.it has no redeeming features whatsoever except as a possible parts donor.this is tax exempt and under the 40 year rule will become mot exempt also.for every decent classic car I test I see 2 like this.the owner will do the minimum to get it thru yet another test,if said test is not reqrd he wont bother at all till it snaps in half which quite frankly I am surprised it hasn't already done.i cant fail it on being a wreck much as I would like to but the minimal repair work the guy does is only cos I test it,no other reason.oh yeah,hes an old boy whos convinced his work is top notch and the vehicle is as well despite me showing him repeatedly that this is not the case.i wont be the only tester out there seeing stuff like this either which for me is the most worrying part. Previous MOT by Halfords advised rear pads low, this was on a late Focus with rear DRUMS., work that one out !! I am not concerned about old cars being exempt from test, many are in better condition than when new.....what concerns me is the home build trikes that have some how got passed for road use....many testers run the other way when they turn up for test. I have tested many over the years, old motors surly can't be as bad as trikes?....can they? I was on a London bus, about thirty years ago, that crashed into the back of a lorry. I hit the seat in front sending teeth through lip ! I believe buses are still driving round London with no seat belts fitted ! I think you will find that most testers make the occasional spelling mistake now and then. I do myself! but if the customer asks I know whayt to say.ps I did notice but so petty I dismissed it. So when will these 7 tonne Tractors pulling 20 tonne trailers need on MOT. God only knows how dangerous they are , taking up over half the road width and wheel size that could easily go up and over any car. Philip you beat me to it, yes I once had a vehicle of testable age presented to me with a seat belt anchorage point secured to a wood chip board, and yes it had passed mot's years previously, and yes I never saw the customer again. Seen all sorts of problems like this over a lifetime, people will always be the same, find the cheap easy Test Stations and tell them its just a second vehicle so it don't matter! One off customers say to me, you know what your talking about, why are you doing this job! Hi, it does not say what year the morris 1000 is, if its pre 60 it dosen't need an M.O.T, but this could have been a volantery M.O.T, as some insurance companies are demanding them, and could have not been seen for a few years, also it could have been that the tester thought because it was pre 86 and didnt need rear belts they never checked them, who knows ? ?, but it brings home why should any vehicle on the road be exempt from having a basic safety check. I know of a garage who failed a morris 1000, 5 years befor the pre 60 rule, only to buy the car and run it without an mot with the defects it had when they failed it. I think the lack of DVSA staff makes it easy for the dodgy testers to get away with it. I know of a station that hasn't had a visit in 3 years. What about those 70s vehicles that are MOT exempt ,lots of issues when they were 10/20 yrs old and subject to yearly tests? Put copies of these photos and their stories on a notice board in your reception area, so that customers can see what sort of defects are being found. and the problem with this is the customer buys new tyres and gets a free mot so what it do not matter if mot is paid at full price or at a discount price car will still be tested the right way. I wouldn’t always bet on that one ! we need to continue testing all vehicles no matter how old they are,this is for the safety of all other road users especially my family . Or most dont even need an MOT anymore! That's not what I was told on my last refresher course a couple of years ago. He seemed really chuffed with himself about it and kept coming up with scenarios were he had removed and fitted different seat belts in different cars for fun. All of which pass and advise. The whole system is a joke. No but if fitted have to be tested! I wonder how many nearly detached wheels are on the road. A few months ago, a responsible woman driver (no, not me) was concerned about feel and sound of car. Took the car to be checked by a respected local mechanic, who declared all in order. The following day on car's first trip out, worse noise and unsteady handling. Turned out that this elderly back axle had cracked and wheel hanging on by a thread. Fortunately, driver crawled short distance home safely and called RAC, who declared car unroadworthy. This lady very shaken at what could have been - respected mechanic no longer employed. Yes,it was irresponsible to drive it home,in that condition. The problem I see here is there is too much freedom for people to do what they want, driven by customers who grind the mechanics down, pressures of business to meet very unrealistic targets and then customers roll in through the doors, can you just change my light bulb! The rest of the vehicles condition seriously unknown! When any customer presents a vehicle to me for anything at all, that vehicle gets a free visual vehicle condition report carried out on it, then a written record is retained, it does not take long to complete and by the end I know if that vehicle is both safe to work on and safe to complete a road test if required. The idea came from a main dealers I worked for over 15 years ago, and then I did some digging to find out why the main dealers did these reports on every vehicle presented, turns out that a garage was took to court, the old bailey where two ladies in a van had a serious road accident and the passenger was killed, the garage had every excuse under the sun, but was convicted. The saying goes, it will never happen to me, but unless the mechanic/business owner has more than half a shilling up stairs, and knows how to run the business and do the job proper, then the short straw is just around the corner. i have seen horrors that have been tested elsewhere, hence i do every mot test as it was my first. routine is imperitive in my world. thank god we have some decent testers about. That Morris Minor is now exempt from testing with this new, in my opinion, crackpot rolling 40 year system. Up 1977 is now going to be exempt. The more of these horror stories that we can share with the exempt vehicles the more chance there is of this exemption being removed. The Metro came out in 1980, makes you think doesn't it? Why are you worried about Metros in particular? There aren't many left and the ones that are on the roads are in the hands of car enthusiasts. That Morris Minor IS MOT exempt so there is a good reason to continue to test older vehicles. only if pre-1960 at the moment. next may will see 40 year old and older vehicles exempt. And theres thought of increasing the mot tests to every 2years? I normally call it shine over sh**e when you see a lovely old classic and underneath is like the hull of an old fishing trawler. amazing hope testers never miss such faults. It would be great to catalogue some of the unusual finds in some of those difficult to access and weak areas that maybe dealers know about because of their experience on one make ! These horror stories might not happen if all cars have to have test once a year.not excempt like old cars.whot you think?. Always worth a look at the stories . To think that Morris Minor could have been of an age that is MOT Exempt... If it were, it would still be driving around like that!! It was built without a Seat Belt ? So it had nothing anyway for many years ? OK, what is on there is completely useless, but should it be just removed to prevent anyone having a false sense of security ? As for passengers riding loose in the back of a vehicle, the Police do this when they pick up troublemakers on the street. Throw them in the caged section and let them travel loose. Often Ambulances do this too. Food for thought. Police vans have sideways seating- no requirement for seatbelts in these vehicles.